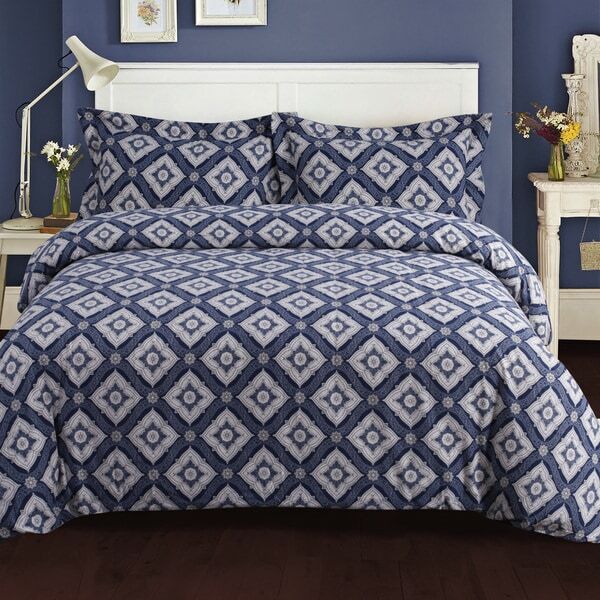 I love this duvet cover! It is beautiful and well made. True to photo. Update your bedroom with this printed flannel duvet cover set featuring an elegant multicolor damask pattern. Woven of multiple-brushed cozy and warm 200-gram luxurious soft cotton flannel, the set includes one oversized duvet cover and two shams. The duvet cover includes internal corner ties that can secure your comforter through its corner loops and prevent shifting. I'm very happy with my new duvet. The fabric is soft and the color is vibrant. It has plenty of length all around my king-size bed to cover the mattress and box spring. There are corner ties inside the duvet to hold the comforter in place, but they are a bit awkward to be use... I frequently have to adjust the comforter to get it in the best position to cover us, but I'm okay with that because I like the length. Love this duvet. Although it was extremely pricey it definitely keeps you warm in the winter. Well made and quality flannel. I would buy this again. Really comfortable and colors look exactly like it did in the pictures. Very soft and cozy. Adult style, not goofy. Too soon to give a full review. Initial quality seems good, it has ties inside corners which is very important to me. I will re-review in a year. Soft, very pretty, classic look, and goes great in the room.